GridCast: live and behind the scenes of grid computing: Immerse yourself in a virtual world. Introducing ‘e-ScienceCity’! Immerse yourself in a virtual world. Introducing ‘e-ScienceCity’! The team at e-ScienceTalk are delighted to announce the launch of our new virtual e-ScienceCity island at www.e-sciencecity.org. Building on the success of the GridCafé website which introduced people to the world of grids, we have built an interactive space where you will be able to discover more about grids in addition to exploring content on supercomputers, volunteer computing and clouds. 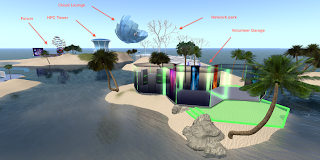 The new virtual e-ScienceCity island is part of an OpenSim pilot, to create and evaluate a virtual venue dedicated to e-science and e-learning. In the upcoming months, e-ScienceCity will also be available in an enhanced 3-D design as part of New World Grid (open source version of Second Life). We’d really like your input into developing our e-ScienceCity. The island is still under construction and we would like to make the journey through the site as enjoyable, helpful and informative as possible to new avatars. If you have any suggestions for content please do email us at info@e-sciencetalk. What do you think you might find in an e-ScienceCity? The first area of the virtual world to be inhabited is CloudLounge which provides a description of the technologies and issues surrounding cloud computing. For those who would like to contribute your own desktop power there’s also a volunteer garage (currently populated with our latest e-ScienceBriefing, desktop grids). You can climb up our HPC Tower to find out about supercomputers. The latest e-infrastructure news will also be broadcast at the island’s Communication Centre and a forum has been created to help encourage debate on issues relating to e-science infrastructure. Please do share with us your ideas!